Rei-ki is a system of manual therapy which is a passive, stationary, hands-on treatment, not requiring movement or pressure for its principal effects of relieving stress and pain and stimulating the body's own healing processes, by enhancing the flow of life force energy through direct touch. The same protocols regarding client permission, hygiene and safe practices apply as to other manual therapies. However, rei-ki is entirely effective when the hands are placed on top of clothing and other coverings and it is not necessary to disrobe. The rei-ki therapist generally provides a rei-ki treatment whilst seated at a therapy table with the height adjusted accordingly. When providing a full rei-ki treatment, there are a series of hand positions which progressively cover the torso front, head and back - limbs and neck are only addressed as 'extras' if there is a specific problem at one of these sites. Out of respect for privacy, care should be taken to avoid directly touching any intimate site on the client's body. Reiki is taught as a self-help procedure and to give assistance to family and friends or as an aid in voluntary service, and the training does not include diagnosis, nor prescription. Before setting up a commercial clinic incorporating rei-ki as one of the treatments, professional practitioners are advised to undertake further training, from a registered training organisation offering units in health sciences, including basic anatomy, diagnosis and prescription and professional practice ethics and management. Reiki can be applied as an adjunct to other first aid systems, placing the hands over the injured site, waiting until the perceptible energy flow through the hands ceases or wanes. In addition to assisting in the relief of stress and shock, it can help reduce swelling and lessen the flow of blood. Standard hygiene procedures apply. In the case of burns, it is advisable to place hands slightly above the skin, without direct touch, as the energy flow associated with the rei-ki may on occasion feel quite hot, even as its effects lessen the distress associated with burns. A full rei-ki treatment generally will take an hour to an hour and a half. Whilst rei-ki may be performed in a formal clinic environment, this is not essential for good effect. However it is recommended that the treatment table be set up i a clear and private space. In hospitals and hospices, rei-ki can be provided at the bedside without adversely affecting other treatments and can aid peace of mind in such a situation. 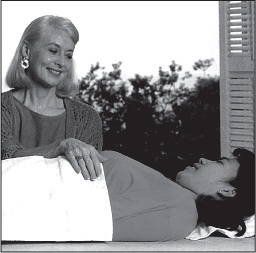 Having set up the therapy table to a suitable height, so that both client and therapist are at ease, it is generally most comfortable for the client, in the first instance lying on their back, if a pillow is laid under the head and another pillow or roll under the thighs, before the knees, with a light covering for the eyes (to keep out overhead light). Some women may also find when lying face down on their abdomen, in order to receive rei-ki on the back, that it is more comfortable when a shallow pillow is placed between breasts and hips, to support the spine. As the client is likely to drift off into a meditational alpha state after some minutes, soothing music can assist this process, if the client so desires. Other than enquiring after the comfort of the client, conversation initiated by the practitioner is not necessary, unless the practitioner is a trained counselor. However some clients have a need to release emotions and may express themselves volubly, in which case the practitioner is advised to be receptive and supportive but not to give advice other than common sense suggestions, unless qualified to do so. Obviously gossip and negativity are discouraged. The flow of rei-ki energy through the hands sponsors self-healing for both the therapist and client, by stimulating the innate, internal regenerative processes of the body, and there is no special act of will or intention required. It is not necessary to repeat special words or mantras, to follow special breathing procedures or thought processes for rei-ki to be effective. Applying rei-ki through the hands is entirely passive and may be perceived as warmth or even deeply penetrating heat; sometimes it can feel chill or numb and on other occasions rei-ki may feel tingly or prickly, with observable tremors or vibrations. The subtle flow of rei-ki does not originate from the practitioner, but is extrinsic, flowing through both practitioner and client, so that both parties benefit from life force energy renewal during the treatment procedure but without the need to direct it through conscious effort. Rei-ki does not occur spontaneously without training - to practice rei-ki at the touch of your hands, it is necessary to participate in a three day seminar (approx 20 hours) which includes practical hands-on demonstrations, instruction and four direct energy transfer transmissions from the specially trained teacher to each student. Seminar content is adapted to the needs of individual participants, with experiential and anecdotal sharing of experiences between students and teacher. A further advanced rei-ki training course is optional, which involves another 20 hour training and includes methods to project rei-ki energy over distance without direct touch and enhancement of telepathic gifts. Therefore no further courses are necessary. Opportunities to review rei-ki procedures are provided to graduates within the Usui Reiki Network internationally. Graduates may contact their local co-ordinator post seminar if they have any queries. training to teach rei-ki follows a lengthy apprenticeship over many years, with prior skills required in practice and training. The Usui Reiki Network, founded by Barbara McGregor in 1990, has centres in each mainland capital city of Australia as well as in London, Singapore, Hong Kong and Kuala Lumpur.